Welcome to Alphasoft! We are a Microsoft Concept Store located in Funan Center. We offer products from Microsoft and Symantec. This icon represents a link to an external site that is not under the control of Alphasoft. Alphasoft takes no responsibility for these sites. CONGRATULATIONS! You've stopped by this site during our launch. 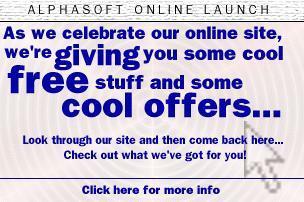 Look through our site, then come back here and go to the Launch Specials page! You stand a chance to get free stuff and cool offers!